After a great deal of effort and some £150K of money, the end of 2014 saw the completion of the exterior works to the church. By the end of 2015, much of the internal redecoration had also been completed. The final element of external works was the introduction of exterior lighting to the clock and towers (which now highlights the new stone cross). 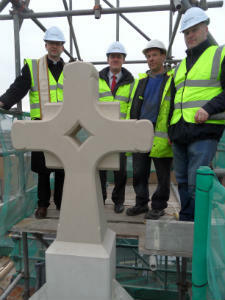 All this work would not have been possible without the generous support of English Heritage while Heritage of London Trust donated the price of the cross. 2014 also saw works to the church grounds, with a new parking surface. Much of the exterior work was to the pointing and down pipes, but we were also able to replace all the louvres in the bell tower and have the clock face repainted. During 2015 new church signs were also erected. With the main doors now open every day, and lighting at night, St John’s presents a better face to those who pass and visit. The effects of water penetration were evident within the church and, in the summer of 2015, repairs to plaster work and re-painting began. A new boiler has also been installed along with alterations to some of the pipes and radiators. There are now plans to provide improvements to the back of the church, including an enclosed servery and accessible lavatory. A decision will need to be made about the location of the font. Our aim is to improve facilities at St John’s in order to serve the needs of the local community and to accommodate, for example, the expanding number of children who attend services and Junior Church. However, other schemes are dependent on financing but a new hall to replace the vestry is an aspiration which will hopefully become reality. In the meantime, work has been completed on restoring the old boiler house which now serves as a meeting room and office space.